Is it officially a new year, really, if we haven't celebrated with Tesshi-e's yearly Mild Escape game? I say to thee nay, but now that Mild Escape 7 is finally here, we can break out the streamers and confetti! Each year, as the narrator tells us at the start, we find ourselves back at a particular door in this series of escape games, and this time is no different. Click your way around the room to explore and interact while some evocative piano music makes you feel weirdly nostalgic and melancholy. If you highlight an item in your inventory, you can click "about item" to view it up close and try to manipulate it, or just click in the area you're exploring to try to use it there. Some objects in your surroundings can't be carried or picked up, but if you click and hold on them, a closer or alternate view might be displayed. Like any good Tesshi-e game worth its salt, Mild Escape 7 is all about finding clues to solve the puzzle locks in your way. Though not as obscure or misleading as some other escape developers, Tesshi-e has managed to craft puzzles that feel logical and challenging in a way that encourages you to think about the information you have rather than simply resorting to the old point-and-click standby of desperately clicking everything on everything else. In most cases, following your gut instinct to use or solve something winds up being accurate, which shows a developer who thinks about the player's potential thought patterns, rather than expecting you to interpret their own. The atmosphere is particularly lovely, with nice touches such as the persistent and accurate reflections of objects and points of light adding to the subtle detail. The game says "happy coin will bring happiness to you", but if you're a fan of escape games, then Tesshi-e is probably always a bearer of good tidings as well, with Mild Escape 7 another jewel in the crown... a crown so jewel encrusted at this point it's probably causing some series neck strain, but heavy is the head and all that. Thanks to Cyberjar 88 for sending this one in! Mild Escape 7 Walkthrough now available! This game has two endings: normal and "good". The two endings are a bit different from each other, so I think it's worth seeing both, and it doesn't matter which one you see first. In the umbrella stand, on the exit door view. Inside the right-most cupboard, on the exit door view. On the ledge of the second window from the left, on the window view. Tucked into the stand of the blue table, on the window view. On the left-hand edge of the desk, in the desk view. Inside the middle clear plastic drawer on top of the desk, on the desk view. Inside the bottom clear plastic drawer on top of the desk, on the desk view. Inside the paper "Mild Escape" bag on the shelves, on the guitar view. Once you have taken the umbrella, you can look inside and see an item out of reach at the bottom of the stand. To get it you will need the umbrella and the sucking disc. View the umbrella by using the "About Item" button, then select the sucking disc and use it on the tip of the umbrella. Now use this new tool on the item at the bottom of the umbrella stand to receive the ball (Libra). The door can be opened with the item found by solving the green box with three indentations puzzle. The clue for the hippo statue code can be seen once you have found the compact disc. Click on the computer under the desk to open the optical drive tray, and insert the compact disc. The screen on top of the desk will have changed to show a clue to this puzzle. The clue looks like a simple subtraction problem, but the answer would be longer than the four digits which we need. It might help to think about it as two lists of individual digits, rather than two numbers. The code can be found by removing every occurrence of the digits 2, 0, 5, and 6 from the first group of digits. The code to open the hippo statue is 7143. Enter the code to collect a clover-shaped key. This cupboard can be opened with the item found by solving the hippo statue puzzle. Collect the screwdriver. This puzzle can be solved once you have the bronze, silver, and gold medals. You need to put the three medals into the three indentations, but what is the correct order? There is a clue in the bottom-left desk drawer. Solve the puzzle and collect a heart-shaped key. Now we have a new tray with an indentation that reads "Gold". But removing the gold medal from its position above causes the tray to close. What other object could we use here? The compact disc is round and golden; we can remove it from the computer by opening the tray again and taking it. But the box seems to reject the compact disc without doing anything, if we put it into the "Gold" tray. Is there another way around this? Yes. Remove the gold medal from its place above, and put the compact disc in its place. This will still cause the tray to open. Now we can put the real gold medal into the "Gold" tray. The box will take it in, and then re-open the tray which now holds the happy coin. Collect the happy coin for the "Good Ending". 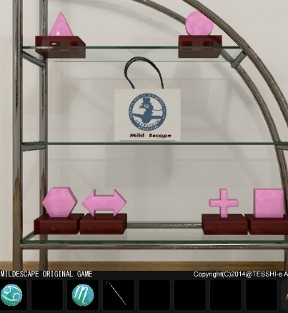 This cupboard can be opened with the item found by solving the left-most cupboard puzzle. Collect the silver medal. The clue for this puzzle can be found once you have the note and the pencil, and also have solved the left-middle desk drawer puzzle. View the note by using the "About Item" button, select the pencil, and then use it on the note. It's a series of astrological symbols; the same symbols that are featured on the six balls found around the room. The order of symbols on the note (left to right) gives the order in which to press the buttons on the bird statue. The symbols are linked to the buttons by the configuration in which you placed the balls in the middle-left drawer puzzle. This puzzle can be solved once you have the umbrella and the unusual looking ornament. View the unusual looking ornament by using the "About Item" button, and click on it to separate the metal upper part from the blue base. Now view the umbrella, select the upper part of the unusual ornament, and then use it on the tip of the umbrella. Use this new tool on the hanging pot-plant and you will be able to collect the sucking disc. The clues for this puzzle can be found by examining the books on top of the desk, and noting the position of the pink figures on the shelves in the guitar view. While the same shapes appear both in the book and on the shelves, they are lined up in a single row in the book, while on the shelves they are grouped into four corners. You must tap the corners of the picture in the order given left to right in the book, in order to solve this puzzle and be able to collect the spade-shaped key. The correct order is upper-left, lower-right, lower-right, lower-left, upper-right, lower-left. This drawer can be opened with the item found by solving the happy coin picture puzzle. Open the drawer to collect the pencil. This puzzle can be solved once you have found all six balls with astrological signs on them. Five balls can be found without solving any puzzles; the sixth ball is received after solving the umbrella stand puzzle. This drawer can be opened with the item found by solving the pink bird statue puzzle. Open the drawer to collect the bronze medal. This clues for this puzzle can be found by examining the back of the guitar, and noting the star and red letter "N" on top of the blue table. The back of the guitar reads "NEW SEE". It is noteworthy that there are only four different letters in that phrase. N, E, W, and S; they're compass directions. But assuming that North equals up and trying to enter the code into the box doesn't work. They must be modified somehow. At first glance, the clue on the table top appears to be telling us that North should be equal to down, but this isn't correct, either. Note the orientation of the star beneath the plant in the center of the table. By carefully noting the relative positions of the red N and the star on the table top, we can realize that North should in fact be equal to right on the puzzle. The correct code is right, down, up, left, down, down. Enter the code to collect the gold medal. the big number on the CD. The number tells you to take away the numbers 2, 0, 5 and 6 from the piece of code before. Thanks. I did that in my head and apparently did it wrong. Had the right idea, wrong execution. All better now! It's interesting that they are all Mild Escape, but this is just Mild Escape 7. Once you finish the game the significance of the number 7 is explained. Finished without a walkthrough! And after a number of false starts, even managed to get the Happy Coin! I have the six balls, and the note with an order of symbols. Now, how do I translate that to putting them into the slots in the second drawer? And why the heck can't I remove them after I've placed them? It doesn't matter what order you put them in, all that matters is that you click on the OTHER puzzle in the order of the symbols on the note. How do I get into the star box? I assume NEW SEE is the compass direction (stealing ideas from Neutral now, are we, Tesshi-e? ), and the big N on the table indicates North, but left-up-down-right-up-up doesn't work, nor does inputting it with the code oriented the way I'm facing. Whoa, what the heck happened? I tried it with right as North, and still nothing... then I clicked back over to this window to post that comment, and when I clicked back, I'd gotten the Gold medal. What did I do, and why did it take so long to tell me I'd gotten it right? I've got the heart key. Now all I need is the Happy Coin. Now, when I put the BGS in and it opens to ask for Gold, am I supposed to wedge something in there to keep it from closing? Or wait... is it the... BRB, checking something. I think once you find the code for the star box, you can brute force it and don't really need that table clue. The table clue is a bit misleading because you think that side of the room is north but really it's the orientation of the star under the plant that matters. Still, brute forcing it is possible. And, it's what you end up doing by default trying to figure out the clues. But, what I really mean to say is that I think the idea about waiting for the coin to pop out is that you just have to close the drawer and open it back up. A bit weird. It's sort of like that puzzle is an exercise in frustration You give up on it and come back, desperately searching old areas because you're stuck, and there's the coin, maybe. If you get the code right. No real way to know you got the code right unless you accidentally close the drawer and open it back up to try the code again and surprise there's a coin. I'm playing with the idea of the walkthrough. This is all the stuff that you would find without really trying. It doesn't solve any puzzles or really give anything away. It just lets you know if you missed anything obvious when you first looked around the room. What do you guys think of this kind of format? These games usually have clues out in the open that aren't obviously obvious, so I left those out because pointing them out would be too spoilery for what I'm going for. Mister HIppo is stationed above a combination lock of four numbers 0-9. There is a wooden box with three circular indentations set in felt. Mister Birdie is perched above a wooden box with six buttons. There's something unreachable at the bottom of the umbrella stand. You can't reach the plant. The cabinet on the left is locked. The middle cabinet is secured with screws. Ball in bottom plastic drawer. Note book in middle drawer. Inside the bottom left drawer. The happy coin picture frame waggles, as they do. Inside the middle left drawer, there's a six holed whatsit. The top left drawer is locked. The CD tray on the computer opens. There's a bestarred and shiny four buttoned device in the middle right drawer. The top right drawer is locked. Not sure why some are having problems with the code to get the gold coin. I punched in the code and it popped right out. Hmmmm. I tried it again and it popped right out. But, then I tried it zoomed in and I had to close the drawer for it to work. Maybe the game gets cheesed if you zoom in. simply love Tesshi-e. Hands down. This one was simpler, which has its own appeal. But I like them all. You might need another round, flat item to put where the device tells you to put the gold medal - the top part, that is. I followed the directions and changed the order of the medals, but now I need something to keep the gold thing that popped out from closing. I don't have anything round. Suggestions? that walkthrough is confusing. I hope someone can write a step by step one soon. that will rule. but that you don't know what they apply to or how to apply them exactly. just wandering around the room looking for more stuff. I combined two of the items in my inventory to make a new thing. put the cactus thing on the umbrella. there is something in the room that you can't reach. I am at the star box. I assume that the clue from the guitar is to be used here. BUT whether I use the orientation of north is the top button or north is the right nothing works. What ever you get here is not popping out. @Reka: Yeah, that was new and appealingly different. Unable to finish game. I tried 4 different orientations with the star box and none of them worked. I am using chrome latest version and my windows 7 is up to date. It just isn't my day to have any fun. I finally had to draw a compass 4 times to get the last orientation that works. Draw a normal N E S W compass and then write in the new coordinates from above. There was a reference somewhere to a "star under the plant". I did not see a star under the plant with a clue to the proper coordinates. I do have my screen zoomed and there was a reference earlier to that. But when I used the coordinates above it did pop out a gold coin. Well I finally made it out. I thought the clue in the drawer with the medals was the order of the medals but I guess not. I put gold silver and bronze in the 3 circles and got a key. Then I picked up the gold medal and put the CD in its place. and exited but that was not the happy coin end. Too frustrated to play again. So whoever makes it this far... maybe someone here will give some real hints about where the real clue to the order of the medals is. Beautiful but somewhat frustrating game. when you put the medals in the "first" time, the clue from the drawer is correct - gold silver bronze - and the little drawer opens and you get a key. There are 3 letters on the little drop down drawer BGS. Pick up the medals and put them back in the "second" order. Bronze Gold Silver - except don't put the gold medal in the middle instead put the CD that you get back from the computer. The little drawer opens again. Put the gold medal there and another drawer opens with the real happy coin. I struggled with this game. I hope this helps someone else. The plant on the blue N table is sitting on a little star shaped coaster. The orientation of that star with respect to the N is the clue. But, it looks like you just brute forced it, which is what I figured most people would do by default anyway. @Reka: A guidebook to the Louvre is a good analogy, but then, would you also discourage people reading those guidebooks to help them better appreciate the artwork? I think that if the Louvre required its patrons to answer a brief quiz about each painting before being allowed to see the next one, we could forgive people for diving into a guidebook now and then as they toured the collection. It would be a shame if someone dashed through the museum, nose buried in the guidebook, never looking up once, just to say they'd been through the Louvre, but I wonder how many people would really do that. Just as with the proper use of walkthroughs with these games. I feel that a good walkthrough should be written with "stages" of information, so that people can read only as far as they need to get a little "jog" to help them solve their own problem, without seeing the complete solution if possible. That's why I prefer a well-written walkthrough here on Jay is Games, with good use of spoiler tags, to a simple walkthrough or video elsewhere. I think that shipoopie and jackal.lewis made some interesting observations about walkthroughs here on Jay is Games in the comments for Weekday Escape No. 21, as well. We're always thrilled to have different types of walkthroughs... it's so helpful to people who prefer to play games and get help in different ways! :) Thank you everyone. anyone still working on a step by step walkthrough? You can usually find these within a few days on YouTube, 'cause they're easy to make once you have the software. Another amazing Tesshi-e game. The hippo puzzle, at first, seemed quite frustrating, but (and I admit it) after checking the walkthrough, it was quite clever. At least that was the only clue I needed to exit with the happy coin. well anyway if anyone wants to do one that's fine. I might check back from time to time. Love how she calls what she brings to our lives "calm." LOL.